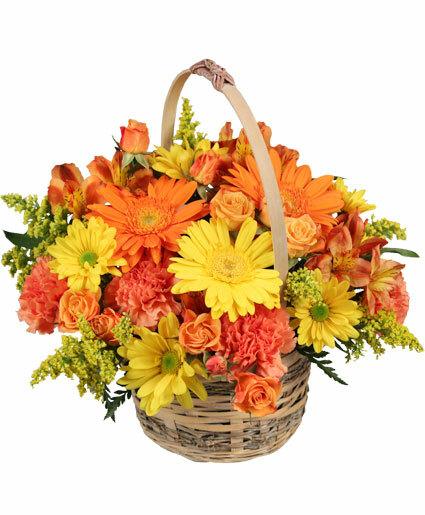 Whitewashed Wicker Basket W Handle & Liner, Wet Floral Foam, Foliage: Leather Leaf, Orange Gerberas, Yellow Gerbera, Orange Miniature Spray Roses, Yellow Daisy Poms, Solidago, Orange Alstroemeria, Orange Carnations. Whitewashed Wicker Basket With Handle & Liner, Wet Floral Foam, Hot Pink Snapdragons, Dark Pink Alstroemeria, Lavender Mini Carnations, Lavender Roses, Purple Lisianthus, White Waxflower, Bupleurum. Roses, Hydrangea, Stock, Larkspur, Spray Roses, Greens. 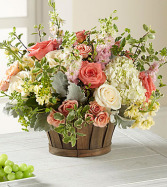 Inspired by French country gardens, this captivating flower bouquet has a Victorian styling your recipient will adore.That perfect happy birthday, thinking of you, or thank you gift!